Headland operated within a confined area where spoil storage and removal necessitated good coordination with the main contractor. The project threw up a number of surprises which required archaeological input into a revised design for the development, and a flexible approach. 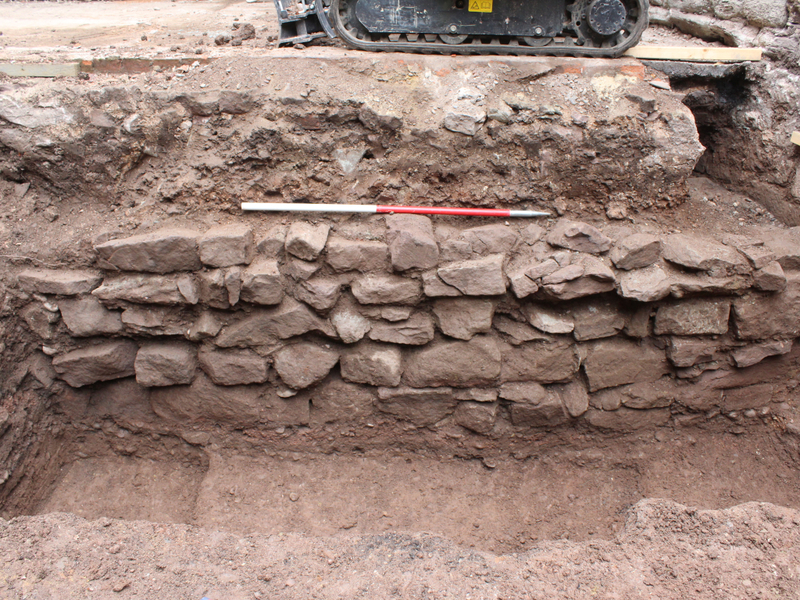 This project involved undertaking archaeological work in connection with improvements to buildings and facilities in the College Cloisters beside Hereford Cathedral. Evaluation trenches identified a ‘lost’ cellar relating to the 15th-century Custos Lodge. The debris within suggested that the cellar had gone out of use and been sealed in the 19th-century. Further evaluation trenches identified medieval floor surfaces and the remains of structures. 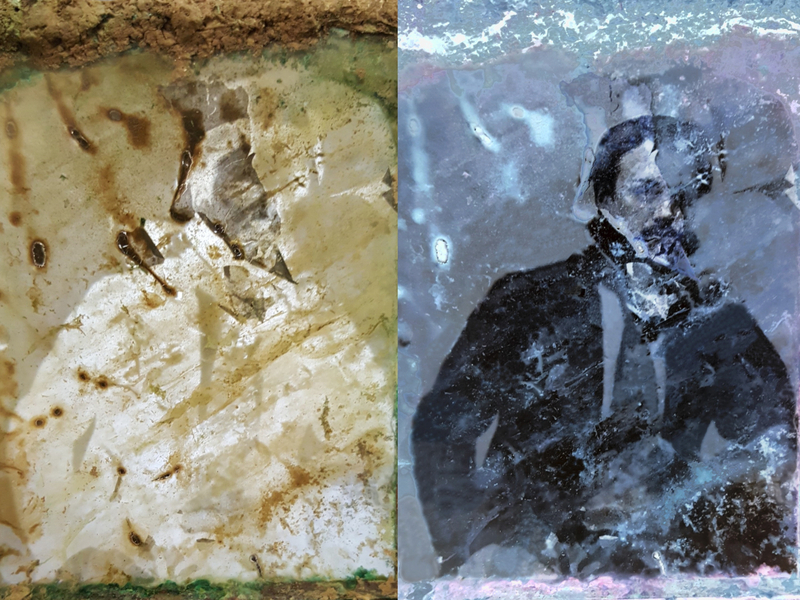 Finds included a photographic plate from the late 19th century that contained the image of a man in formal attire. 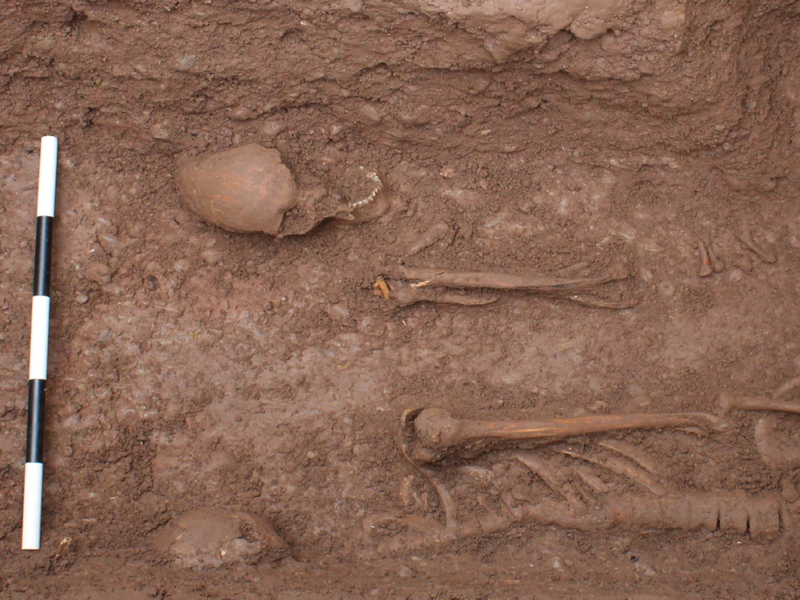 During the excavation phase of works, the remains of three skeletons were discovered at a depth of two metres. 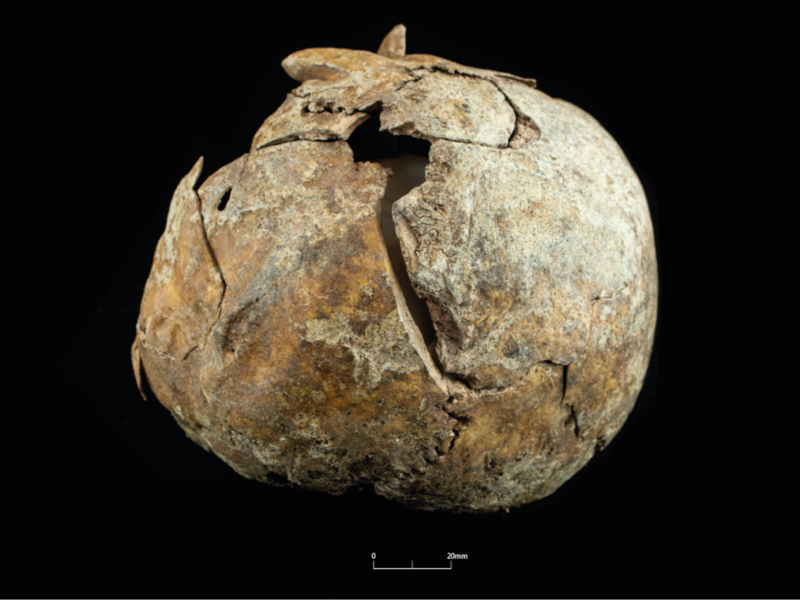 They have been radiocarbon-dated to the 7th and 8th-centuries, prior to the Norman Conquest of England and construction of the current cathedral building. This is a particularly exciting discovery as out of the 2456 burials excavated around the cathedral prior to this only one other has been securely dated to the same period. 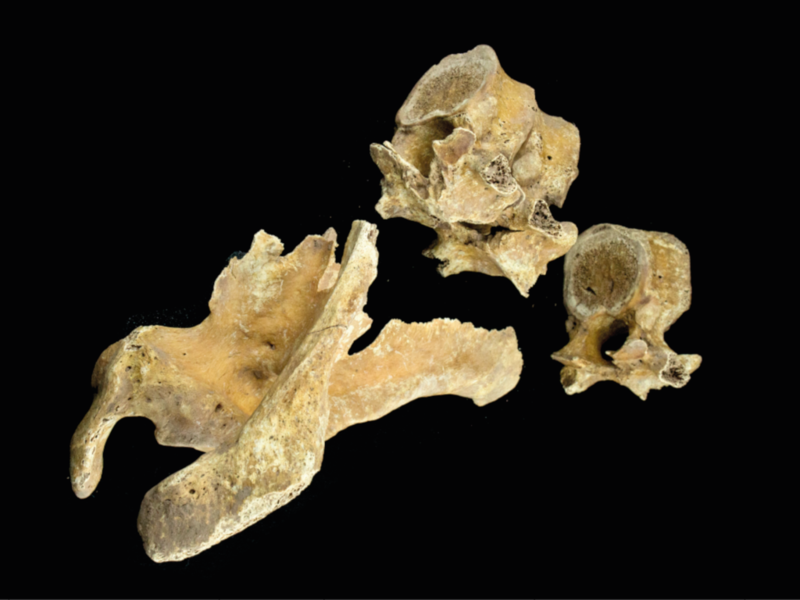 Post-excavation analysis of the skeletons revealed that one was male, one female, and one juvenile. The male, who was 35-46 years old when he died, had suffered at least four, possibly five, blade injuries, two of which would have been fatal. One of these was a literal stab in the back, inflicted with a very sharp, narrow blade while the other was a blow to the back of the head with an edged weapon. Only one of the injuries, a possible cut above the left elbow, shows traces of healing, indicating that the other injuries were inflicted at time of death. 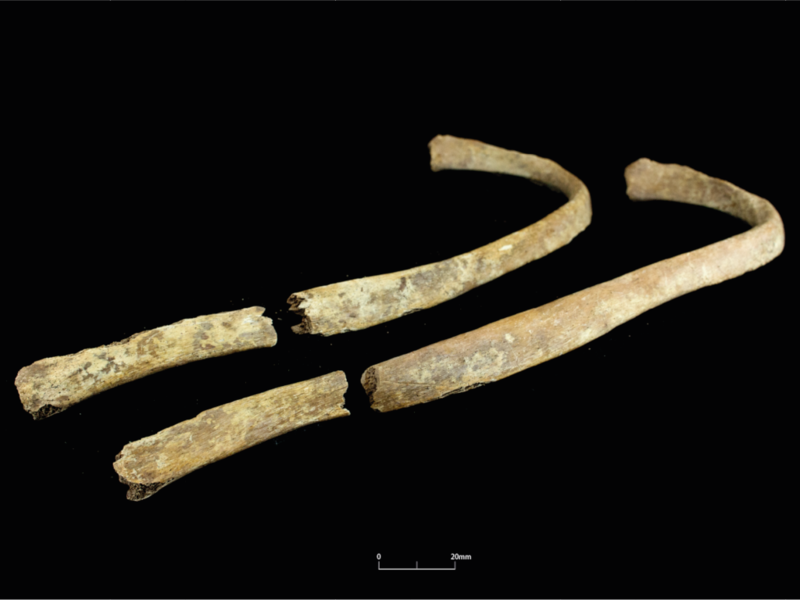 Radiocarbon-dating of this skeleton revealed that this man lived between AD 680-780. Historical sources record that at around this time the Welsh were troubling the English with their attacks. In AD 743 the kings of Mercia and Wessex campaigned against the Welsh, and frequent violent skirmishes between the two forces during this period are referenced, and several Welsh sources record a battle of Hereford taking place in AD 760. Due to the violent nature of his death, it could be speculated that this man was involved in these battles. Given that he has a potentially healed injury to his elbow it is also possible that it wasn’t his first time on the battlefield, although it was certainly his last.